Why is a decanter my valentine gift of choice? A beautiful decanter is a piece that says many things – “here’s to a rock-your-world kinda night” / “bring on the cha-cha” / “let’s get this party started” / “let’s enjoy fun conversation and laughs with great company and a fab bottle of vino” / and it’ll be around for many valentine’s days to come, (hint, hint). They’re a great gift for every valentine; big love, little love, or unconditional friend-love. Plus, design-wise, they’re beeeeeauuuutiful! 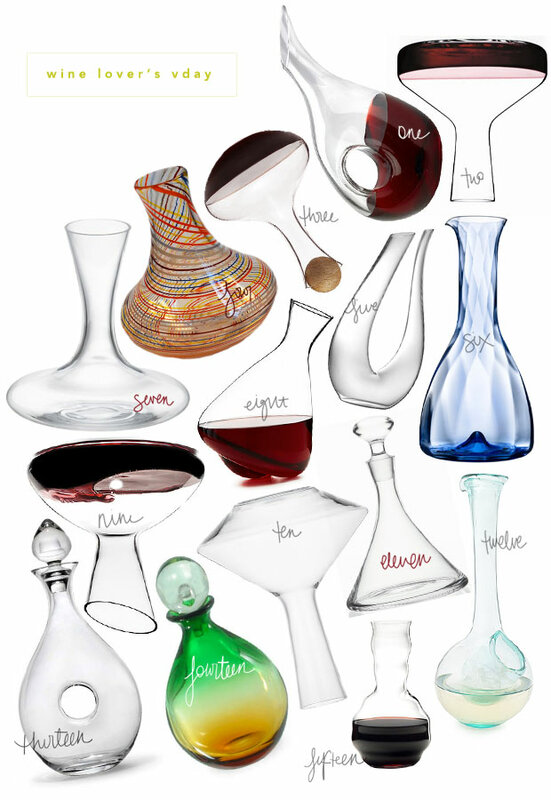 Some of these are hand-blown and can double as sculptural vases in their off-time. Here, i’ve gathered a little bit of everything, from modern and minimalist to adventurous and quirky. And just to be fair to my white wine pals, i tossed in the super-cool #12 // wink // cheers!